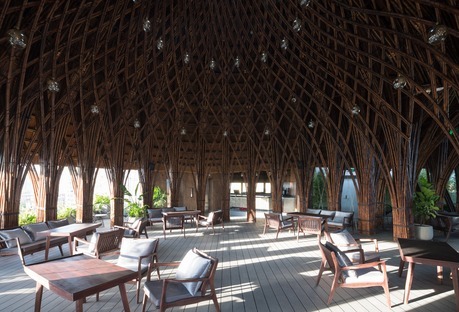 Nocenco Café by Vo Trong Nghia Architects in Vinh, in central Vietnam, features a bamboo roof over an existing building, using inexpensive technologies of great interest and producing a very elegant result. 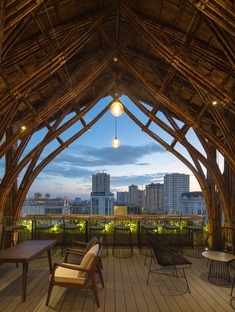 On the seventh floor of a building in the Vietnamese city of Vinh, VTN Architects built a curved bamboo roof combining Gothic and Vietnamese styles for Nocenco Café. 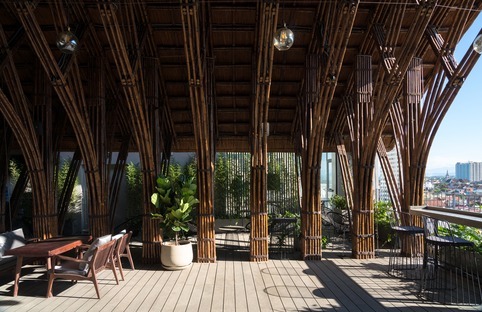 The architects of Vo Trong Nghia built the roof over Nocenco Café, on the seventh floor of a building in the centre of Vinh, in central Vietnam, out of bamboo. The material’s light weight not only made it easy to handle but limits the weight the structure has to support. 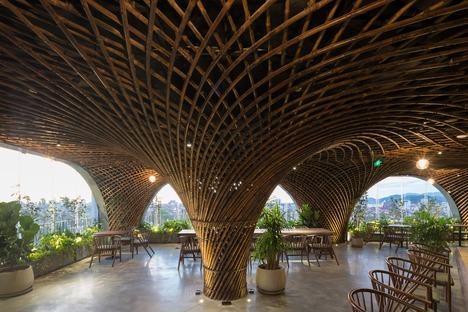 The key to the composition is bamboo, with a dome created by 25 pillars of bamboo bundles, interwoven and spiralling upwards to spread out in different layers and directions, creating a ribbed vault of multiple layers. At right angles to this central core are two asymmetrical arms, the roofs of which are given rhythm by 5 and 9 pairs of polycentric pointed arches, with cusps rising upwards to give the construction a solemn, elegant appearance. In this case, however, the arches are made up of a square bundle of no less than 42 canes of bamboo, which spread out fan-like in five different branches of united pairs. The purpose of this division is to reach the various points on the roof, taking advantage of the elastic capacity of the canes, which do not yield, terminating in a keystone at the top. The inclusion of struts permits the double curve required to create the spire, hallmark of the talented architect who designed it. It is impressive to note that the joints were created entirely using ropes, so that the parts are not fixed together but turn on an impure hinge. The architects rejected the idea of creating a more secure connection using metal elements, which would be much more rigid, but also more subject to wear at contact points. Lastly, to complete the roof over the remainder of the level, the spaces are covered with a soft, flowing vault obtained using pillars much lower than the others, creating a welcoming sense of comfort and giving the café local character. Footprint: 438m2 20. GFA: 687 m2 21.